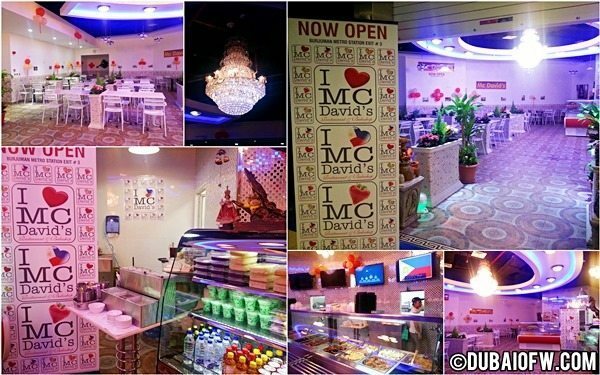 Good news to Pinoys as McDavid’s Restaurant and Bakeshop recently opened inside Burjuman metro station. 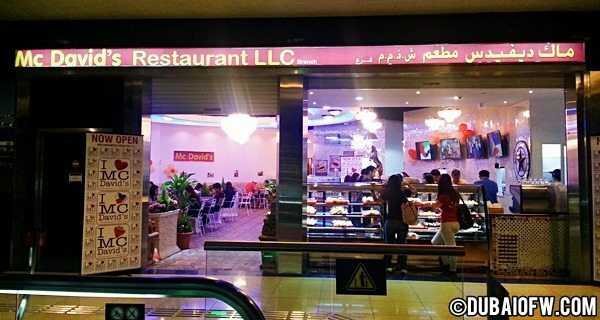 This is the 3rd branch of this Filipino restaurant – the other 2 branches are located in Al Satwa and Al Rigga. Strategically located in the Exit 3 of the metro station, plenty of our kabayans can drop by this store to dine, or buy take away bread and meals. What’s good about this food place is that the food is already on display and you can simply pick from a variety of Pinoy cuisine. 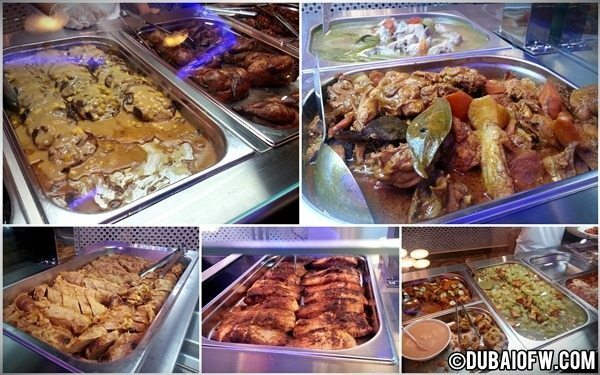 Fish fillet, burger steak, beef steak, bopis, beef stew, menudo, bicol express, afritada, pinakbet, kare-kare, chicken adobo, etc.. – you can choose among plenty of dishes being offered which is great because the food is already there on the counter. 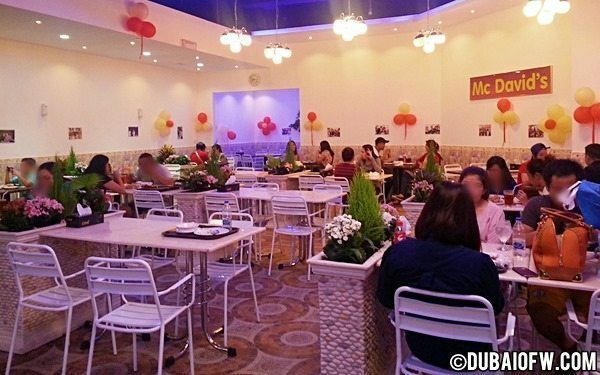 The resto is fresh and lighting inside is bright. There’s even a big chandelier. The staff were all Pinoy when we went there and you can sense our hospitality when it comes to the service. 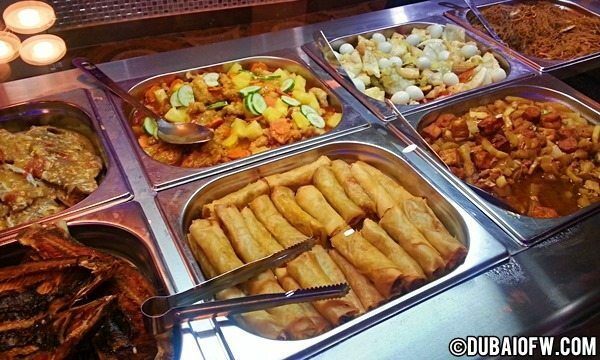 Rice offered is part of the meal and you can get unlimited servings of rice – good for those who are really hungry! We ordered one half-chicken (25 AED) and pinakbet (18 AED). Rice is included in the meals. Unlimited Iced Tea is 10 AED per person. 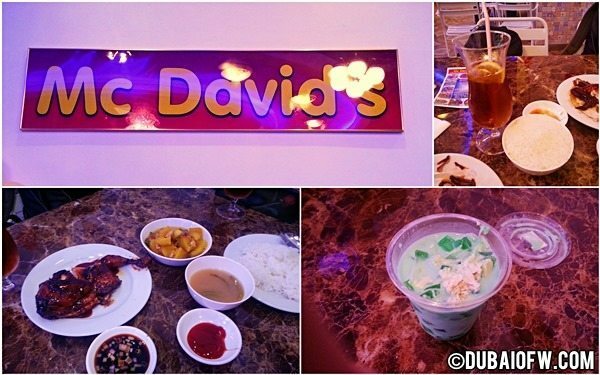 We also ordered 10 AED for the buko pandan dessert. Total amount we paid for 2 persons was 73 AED. We felt it’s already worth it for the price. 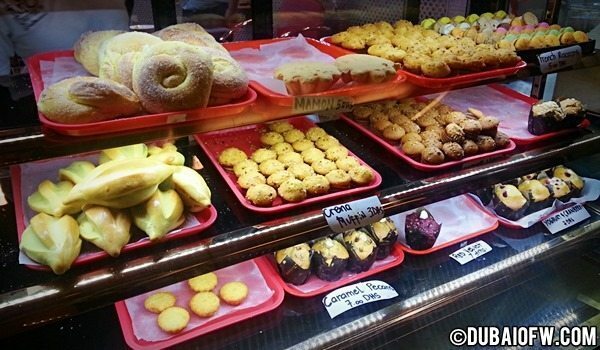 If you’re not into the food, you can simply order bread and pastries like ensaymada, cheese bread, mamon, etc. from the bakery section. You have plenty of choices to choose from to bring home for some quick snacks. McDavid’s: Maraming pagpipilian. Mas pinasarap with unlimited rice! Iba’t-ibang klaseng ulam at tinapay!